Sibu Pegasus Power: What a weekend! In fact my weekend was so packed with excitement, that I am going to have to break this up into at least two posts. We started Saturday morning off by going to the farmers market and spending atrocious amounts of money on fresh veggies. We discovered while we were in the neighbourhood that it was time for the Art Walk. Local artisans set up on the sidewalks in front of willing businesses and show off their art and sell stuff and you can even watch some of them work. My friend though it would be a good idea for me to sit in the blazing sun and have a caricature drawn, so here it is. It only took her about 10 minutes to do this and it is a fairly good representation. I think I might use this as my avatar for awhile. 10 minutes later going back to the office building I can smell it again! I check some of the patios on the other buildings, then decide the fire department is better equipped to find a leak if there should be one. Our Fire Department cannot be reached unless you call 911 - which in this case is rather stupid. I had been hearing sirens and kinda thought they might be attending whatever was causing the smell and didn't want them rushing to respond to nothing. I did search a bit on the web to see how far the smell could travel, but got nothing. I called the non-emergency line for the police and barely got out that I was smelling propane or something, but wasn't sure, when the Cst. (sorry, Constable) informed me that the construction crew for the LRT * had hit the gas line and we might be evacuated soon. As it turns out, they didn't have to evacuate us, we were far enough away, we just happened to be downwind. I finished my shift, went home had supper and headed out about 7.00 p.m. to go to my friends place and fix my bike tires. They had only just finished fixing the line. I have a short cut that I take along the greensward that cuts directly to the avenue that my friend lives on, if I went by surface streets, I would have an extra 4 blocks to walk. This picture is at maximum zoom from where they have cut off my shortcut, back to my parking lot, my bldg is at the far end of the lot. The driveway is on 108 St. This sign pretty much tells you where I am going with this. That idiot could have blown up houses for miles! Not to mention two schools and a community centre and my apartment bldg. That is about a half mile from my place or less as it is about a mile to my friends (by this shortcut). Um, yes, that is a garbage can beside the bike trail. I figured that as they made me smell gas for 5 hours and then had the nerve to cut off my shortcut, I would blog about it. I had to add 6 blocks to my walk after having walked around all morning! (Yes, it adds 2 blocks, because I had to backtrack a bit) But, we got my tires changed with no problems and tightened my brakes and greased my chain and I can change gears much better now! So, for Monday, I am grateful to be here, to have my bike fixed, a still have a roof over my head! I will have to tell you about Sunday on Wednesday as Tuesday is WWC. Well it sounds like you got your share of exercise, eh? I can hardly wait for part two. 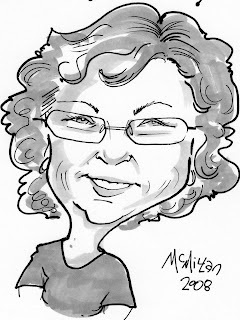 I love the caricature - what a good idea to use if for your avitar. I'm sure glad nothing went KABOOM! Cousin, I am grateful you're okay. I wondered how you fared when I heard this excitement on the news the other night. holy cats, glad you weren't blown to bits! the caricature is beautiful and funny too! I LOVE the caricature! It's terrific, and using it as your avatar is a wonderful idea! Glad to hear your weren't blown up! Whew! Gas scares me--glad you were safe and sound and there was no explosion. And that cartoon of you is great! There are always these sketch artists at local festivals and stuff doing those caricatures. I watch them all the time wishing I had any artistic talent. Your caricature is very cool. There was a construction crew near here not too long ago and ended up killing our power for a couple of hours. I hate it when those goobers do that. Hilary, yes, I sure did. Now that I see it as the avatar, I am not sure, it is a bit weird that small. Me too! Leah, thanks. Not a word on the radio station I was listening to. Sis, thanks, I like it too. Me too! Crabby, the gas doesn't scare me as much as the idiots operating heavy equipment! Thanks, she was fun to sit for too. Jay, I love to watch too and we certainly gathered crowds. It is frustrating when they do things like that. Oh and Jay, they have cut the power about four times so far during this construction. Why? All the services are marked! I love the 911 story but it's only funny because no one got killed. Well, I practically got palpitations just reading about your hectic day. Glad I have a day or two to rest up before Part Deux. I was just talking to the boss, she said they evacuated the houses across the street from the apartment bldgs, but not us? WTF? Frank, I am glad now that I decided to break it up into two posts. I couldn't stand it if I caused you too much excitement! ;) Thanks. Wow! That is scary. A few years back a house a couple of miles from me blew up because someone hit a gas line - fortunately no one was home. Love your pic! I don't see many caricaturists any more. wah. Missicat, it is scary, fortunately it doesn't happen often. Thanks, they are becoming rather rare.